BROCKTON, Mass. – Stoughton senior Jon Lessa and sophomore Sean Doherty each recorded a pair of points and sophomore goalie AJ Scott had an impressive performance in net as the Black Knights beat Attleboro, 2-1. 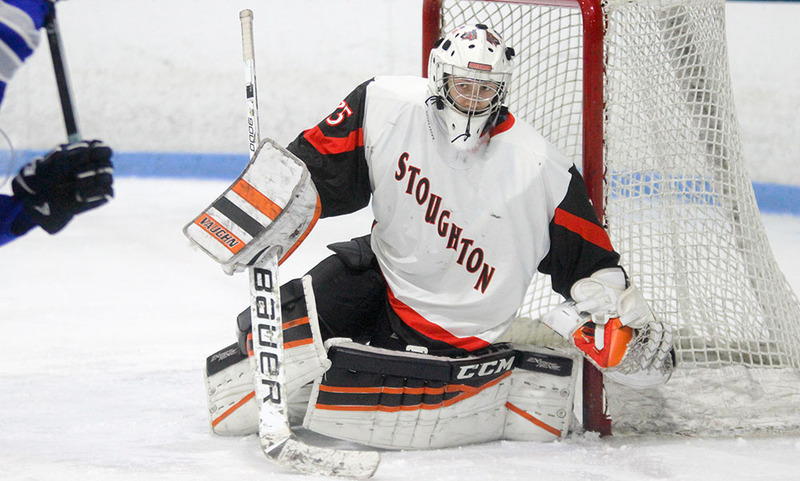 Less than a month after the Bombardiers beat the Black Knights in a league game by the same score, Stoughton flipped the script this time around to get two points in a non-league clash. Scott made 34 saves, including 16 in the first period, while Lessa and Doherty took turns setting each other up for go-ahead goals for the Black Knights. The Bombardiers struck first in the team’s meeting back in January, building a 2-0 lead in the second period. This time around, Stoughton took the lead, not wasting much time on the game’s first power play. An interference call put the Black Knights on a man advantage opportunity and just over a minute in, Stoughton took the lead. Lessa, a captain, raced past a defenseman and dropped a shot on target as he wrapped behind the net. The puck popped free right in the middle and Doherty pounced, firing one in from close range to put Stoughton up 1-0. But less than a minute after taking the lead, the Black Knights took a penalty. Attleboro needed just 10 seconds to tie the contest. Attleboro won the face off, senior PJ Elliott ripped a shot from the slot that Scott was able to stop but sophomore Cam Littig came flying around the back of the net and tucked the rebound chance in from a tight angle to make it 1-1. The Bombardiers nearly carried that momentum into the second period with a big chance early on but Scott stood tall for Stoughton. Just over a minute into the middle frame, the Bombardiers won an offensive face off and the puck ended on the stick of Littig for a close range bid but Scott got just enough to turn it aside. The save turned out to be a big one as the Knights regained the lead just a minute later. This time Doherty played the role of helper and Lessa took on the role of finisher. The sophomore staked past a defenseman towards the boards behind he net, but slammed on the breaks, turned back and fired a centering pass for a one timer that Lessa roofed to put Stoughton up 2-1. The breakaway Mark was referring to came at the midway point of the second period. After the Bombardiers hit the crossbar on a shot from Jake Parker, the two teams traded penalties. That gave Attleboro a man advantage opportunity but it was Stoughton that came away with the best scoring chance. Campbell broke free and was able to go in alone on goal but Andrews stood his ground and denied the bid with a leg save. Scott had one his best sequences near the end of the middle period. Both Parker (20 goals on the season) and Littig had shots through traffic that somehow Scott was able to get with a piece of his glove (on Littig’s shot) and then blocked the second with his chest. Neither side found the back of the net in the third period, both Scott and Andrews making big saves in the frame. First it was Scott, as Parker raced around a defenseman and fired a tight angle shot but the sophomore made the stop with his paddle. While on a power play, Lessa found Doherty on the doorstep but Andrews was quick to react to deny the sophomore. A minute later, Doherty and Lessa used a quick give and go in the attacking area with the latter releasing a close range shot but it sailed wide. Attleboro had its best chance to level the game with 30 seconds to play, skating six players with the goalie pulled. Elliott ended up with the puck in the slot for an open shot but Scott made the point blank save to preserve the win. “We’re not used to being in that position so sometimes the kids get nervous but I thought they kept their composure pretty good there at the end,” Mark said. Attleboro finished with a 35-20 advantage in shots on goal. Stoughton hockey (4-11-2 overall, 1-7 Hockomock) hosts Bellingham on Tuesday while Attleboro (6-11-1, 2-7) will host Shawsheen on Wednesday. The Bombardiers need two points against either Shawsheen or Dighton-Rehoboth to qualify for the state tournament. TAUNTON, Mass. – Prior to the game, Taunton honored its 10 seniors for helping to turn the program around and for being, as head coach Kris Metea announced, the winningest senior class in the 20-year history of the program. On Saturday afternoon against Attleboro, those seniors provided another victory for the Tigers, contributing a combined two goals and three assists while senior goalie Justin Chappell made 26 saves in a 3-2 victory that moves Taunton to .500 in Hockomock play. The Bombardiers looked determined to ruin the day for the Taunton seniors, storming out of the blocks and dominating play in the first period. But, despite leading 11-6 in shots and creating a host of chances, Attleboro went into the first intermission trailing by two goals. Chappell came up big right from the opening face-off. Just three minutes in he spread himself to stop Liam McDonough’s rebound effort after making the initial save on P.J. Elliott. Three minutes later, Cam Carnes teed up junior Jakob Roberts for Taunton’s first shot on goal from inside the blue line and he wristed it into the corner. Attleboro continued to attack and Kyle McCabe thought he had a tying goal with a breakaway effort that Chappell was able to block and control the rebound as it squirted loose. Two minutes later and it was 2-0, as senior Jordan Hoey tossed a puck towards goal that went off the stick of classmate Zack Albert and trickled inside the far post. Sam McKenzie rang the bar just before the end of the period, but Attleboro went into the dressing room playing well, but staring at a two-goal deficit. The Bombardiers finally got one past Chappell four minutes into the second. Cam Littig saw his close-range effort blocked but the puck bounced to Jake Parker and he knocked it home. With four minutes left in the period, Littig set up McCabe in front and he thought he had the game tied but for a sprawling save by Chappell. Attleboro held a 20-12 lead in shots after two periods, but many of those chances were from the outside, as the Taunton defense continued to absorb the pressure. Seniors Mike Volkmann and Svein Ormseth and junior Cam Welby also pushed forward and created shots on Attleboro freshman goalie Derrik Rivet. Taunton thought it had wrapped up the points six minutes into the third when Hoey fed the puck in front to Josh Denham but Rivet (15 saves) came through with a stellar stop to keep Attleboro within one. Just two minutes later, the save loomed even larger when Elliott was able to beat Chappell stick side from the right circle to tie the game. With 4:47 left to play, Taunton went on the power play and 30 seconds later the Tigers had the game-winner. Welby threw the puck at net from beyond the right circle, it deflected off a stick in front and fell to Hoey with an open net and he made no mistake for his second and the game’s decisive point (senior Nick Terry also had an assist on the play). He took another moment to reflect on his seniors and how far they and the program have come in the past few seasons. Taunton (9-3-2, 3-3-0) will get a very tough test against Davenport leader Canton on Wednesday, attempting to make it two-for-two against the current league leaders. Attleboro (5-7-1, 1-4-0) will have a quick turnaround to play Foxboro on Sunday in a big Div. 3 game for the Bombardiers as they try to guarantee tournament play through the Sullivan Rule. Attleboro, 59 @ Taunton, 68 – Final – Tommy MacLean scored 18 points for the Tigers and Lou Vendrell chipped in with 17. Taunton held Attleboro to six points in the fourth quarter to pull out the victory. Stoughton, 65 @ Canton, 70 – Final – Sophomore Devin Foster paced the Bulldogs with 17 points and Tony Harris scored 15 points and pulled down nine boards, as Canton held off a “furious” rally by the Black Knights. Jake Verille scored a career-high 14 in the win. Cam Andrews had a game-high 24 points for Stoughton. North Attleboro, 53 @ Foxboro, 47 – Final – Click here for a recap from this game. King Philip, 49 @ Franklin, 64 – Final – Freshman Chris Edgehill scored a career-high 16 points for the Panthers and Josh Macchi had 14 in the win. Mansfield, 72 @ Oliver Ames, 42 – Final – The Hornets broke the game open with an 18-7 second quarter to take a 20-point lead by halftime. Christian Weber led the way for Mansfield with 17 points and Tyler Boulter added 15. Phil Vigeant (11 points) and Sam Goldberg (10) each reached double-digits for the Hornets. Milford, 65 @ Sharon, 42 – Final – Zack Tamagni scored 22 points to lead the Hawks to the division win. Anthony Arcudi added 15 points and Kayden Kelly scored eight points and pulled in 18 rebounds. Sharon was led by Jimmy Fitzhenry with 11 points. Canton, 41 @ Stoughton, 54 – Final – Val Whalen had another strong game for the Black Knights, scoring 19 points and pulling down 11 rebounds. Freshman Aliyah Wright added 10 points for Stoughton. Hannah Jerrier had a team-high 11 points for the Bulldogs. Foxboro, 47 @ North Attleboro, 53 – Final – Ashley Ahern had a team-high 16 points for the second straight game to help North Attleboro take a two-game lead on the Warriors in the Davenport division. Samantha Taggart also scored 16 for North. Ashley Sampson had a game-high 21 for the Warriors and Lauren Flahive added nine fourth quarter points and pulled in nine rebounds in the loss that ended a six-game win streak for Foxboro. Franklin, 67 @ King Philip, 36 – Final – Kate Morse was the top scorer for the Panthers with 15 points. Megan O’Connell added 11 for Franklin, while Ali Brigham and Erin Skidmore each scored 10 and Carli Koffinke had nine points. KP was led by Shannon O’Connor with 14. Oliver Ames, 17 @ Mansfield, 32 – Final – Click here for a recap from this game. Sharon, 37 @ Milford, 48 – Final – The Eagles battled back to cut the lead to eight points in the fourth quarter, but Milford’s Kate Irwin scored eight of her 15 points in the quarter, including 5-of-6 from the line, to seal the win for the Hawks. Emma Eberhardt led the Eagles with a team-high 13 points and pulled in 12 rebounds, while Shira Stoller scored eight and grabbed seven rebounds. Stoughton, 1 @ Attleboro, 2 – Final – P.J. Elliott scored a power play goal in the second period that turned out to be the game-winner. Jake Parker had the other goal for Attleboro. Ryan Chipman had the Stoughton goal. All three of the game’s goals were scored in the second period. Masconomet Quad (Oliver Ames) – Oliver Ames went 1-2 on the day, beating Burlington 47-24 but falling to Arlington (37-31) and to Masconomet (40-39). Anthony Berksza (145), Jay Fruci (220) and Dean Pacini (195) each went 3-0 on the day for the Tigers. FRANKLIN, Mass.- In a battle between Eastern and Western Mass. hockey on Tuesday at the Pirelli Veterans Arena in Franklin, the West was victorious as Attleboro fell 5-3 to Ludlow in the first night of the 37th annual Bellingham Christmas Tournament. Before the game, both teams hung up their own respective No. 10 and No. 19 jerseys to honor Falmouth hockey’s James Levin and Owen Higgins, who passed away in a tragic car accident last Thursday. The players who wear those numbers for their own teams (P.J. Elliott and Dylan Wallace for Attleboro and Michael Medina and Nicholas Dobek for Ludlow) took on different jerseys for the evening in order to take part. Attleboro came out of the gates swinging in the first period, finding the back of the net first as Cam Littig set up Wallace for a wrist shot from the point with 13:05 remaining. The Lions were quick to strike back, as less than two minutes later, Cole Moutinho came down the left wing to snipe a shot into the upper right corner of the Attleboro goal, drawing the sides even with 11:28 left before the first intermission. Both teams brought the physicality, with Attleboro showing it wasn’t afraid to use the body and Ludlow responding. The Lions drew two penalties in the period, the first a high-sticking call on Ryan Martin and the second cross-checking on Matt Leblanc, but the Bombardiers were unable to capitalize on the opportunities. 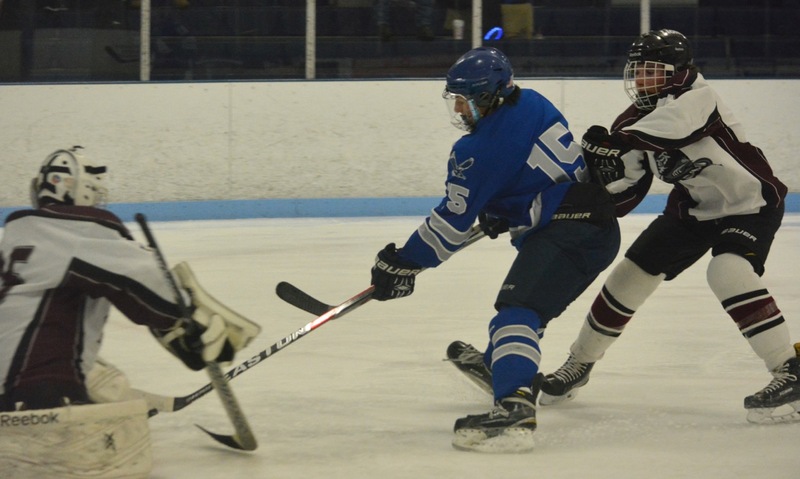 While Attleboro looked to have momentum on the second power play, Max Cocchi stole the puck at the Bombardiers blue line and skated away, beating one Bombardiers defenseman before the senior captain put it past goalie Evan Andrews to put the Lions back in the lead. Going into the second period, both teams continued with much of the same; exchanging shots and checks while play remained fairly even. Both teams had opportunities, but were denied in the end by missed shots or the play of the goaltenders. Attleboro evened the score again with 8:33 left in the period. Jake Parker broke between two defenseman and pushed forward towards goal under tight coverage, just managing to send a backhander past Ludlow goalie Alex Will to draw the Bombardiers level at 2-2. The Lions retook the lead with 6:05 left as Leblanc connected with Owen Burke, who with a turn and backhanded shot made it 3-2. The Bombardiers responded just over a minute and a half later as another backhanded shot, this time from Ryan Morry, found the top shelf of the goal to draw them even at 3-3 with 4:29 remaining in the second. While Attleboro looked hungry to get the lead back, it was the Lions that scored with 1:30 left in the period as Moutinho’s slap shot was tipped in by a Bombardier defenseman to give the sophomore his second goal of the night as once again, the Lions went into an intermission with a one-goal lead. The Lions carried their momentum into the third period and were able to make it 5-3 within the first minute of action. Cocchi fed Logan Cognac the puck and the sophomore captain finished the job with 14:06 left to play. For the remainder of the game, the team size advantage played a significant factor as Ludlow was able to call on players from their bench while Attleboro had more limited options and looked tired on the ice. The team substituted freshman Derek Rivet for Andrews following the fifth goal, and he was able to make a few saves, including on two power play attempts for the Lions, but in the end it wasn’t enough. “I think sometimes what happens is [the players] get overzealous and they let their emotions overtake them and they get out of position, and they don’t stay within the structure that we’ve been trying to get across to them,” said Homer, adding that was to be expected with a core of younger players and that he was proud to see his team continue to fight when down. “They’re working hard [but] we just have to find a way to meld it together,” said Homer. Both teams will close out the tournament on Wednesday night. Attleboro (2-3) will face the host team Bellingham in the consolation game at 6:30, while Ludlow will play Littleton-Bromfield for the tournament title. Foxboro had a down year a season ago but new head coach Mark Cedorchuk brings back the team’s leading scorer from a year ago in senior captain Mike Carresi. Carresi is a creative forward that creates a lot of opportunities for teammates. He’s a strong skater that can drive into the zone, allowing teammates to set up. His ability to set teammates up was apparent a season ago when Carresi led the Warriors with 10 assists. He was second on the team with seven goals a season ago, so he’s also able to finish in and around the net. He finished with a team-high 17 points for Foxboro. The Warriors have a lot of offensive talent back this year, including leading scorer Pete Smith, so expect Carresi’s playmaking ability to factor in again this year. The junior forward returns after a strong sophomore season in which he led the Warriors in scoring with 11 goals and 15 assists, for a team-high 26 points. With the top three scorers back from last year’s team, which qualified for the Div. 1 state tournament, Cooke and KP will have high expectations for the upcoming winter. A quick, talented skater, Cooke gives the Warriors speed through the middle of the ice and he has the stick handling ability to create scoring opportunities out of nothing. As Cooke continues to develop the physical side of his game and his two-way play, he gives KP a major weapon on the first line to cause even the top defenses problems. Cooke could benefit from more continuity in the program as well, with second-year coach Paul Carlow returning to build on the system he implemented last year. The senior forward is one of the main attacking players that returns for the Bombardiers and will enter his final season with a new coach, Mark Homer, and a new home rink, New England Sports Village. With only 15 players and two goalies on this year’s roster, Elliott will see plenty of ice time to try and show off his strong stick handling ability and good finishing touch that helped him finish with 17 goals and 17 assists last season. It will be tough to keep pushing up and down the ice without the depth of some of the other Hock teams, but Elliott and the Bombardiers are accustomed to that and will be hoping to mark their first season in their new home with a return to the playoffs after narrowly missing out in the final game last year. One of the biggest question marks for the Black Knights for the 2016-2017 is who will replace the scoring production of the graduated Mark Sheehan. Stoughton has a good candidate in senior forward Jon Lessa. A year ago, the senior was second on the team in scoring with nine goals while finishing third overall in points with 15. He possesses a quick right-handed shot that doesn’t require much time or space to get off. He has some height that gives him an advantage when carrying the puck or fighting down low on the boards. The Black Knights don’t have as much depth as some of the other Hockomock teams so Lessa, who has already scored this season, should see plenty of ice time. Canton has had a lot skilled players come through the program in recent years but Jackson Maffeo, a defenseman, stands out among the best. The 2015-2016 HockomockSports.com Player of the Year has not only been one of the best at his position over the past two years, but one of the best players period. We’ve seen how good Maffeo’s puck skills are over the past two years and we expect more of the same again this year. He has a terrific shot – one of the best in the area and adds a lot to the offense with his ability to move the puck, finishing with two goals and 12 assists last year. Defensively, there isn’t much to say that hasn’t already been said in the past. He’s one of the most physical players in the league and does it all within the rules. His hockey intelligence is superior to most in the league. The Bulldogs have their top four defenseman from last season so that should be a strong suit this year. The junior forward is coming off a season in which he led the Panthers in scoring as a sophomore, helping Franklin complete an unbeaten league campaign, clinching another Kelley-Rex division title, and also making history as part of the Div. 1 state championship team. He had a team-high 15 goals and 20 points last season. This winter, Miller comes in with even more expectations, as Franklin continues to make itself a program to watch statewide and building its resume with tough non-league games, such as a rematch of the state title game against St. Mary’s. Miller will have a lot of help up front as the Panthers return a core of forwards, including Adam Assad and state title game hero Luke Downie, but Miller remains the lynchpin with his combination of speed and strength. He has no problem battling for a puck against the boards and can break free with his skating ability in open ice. 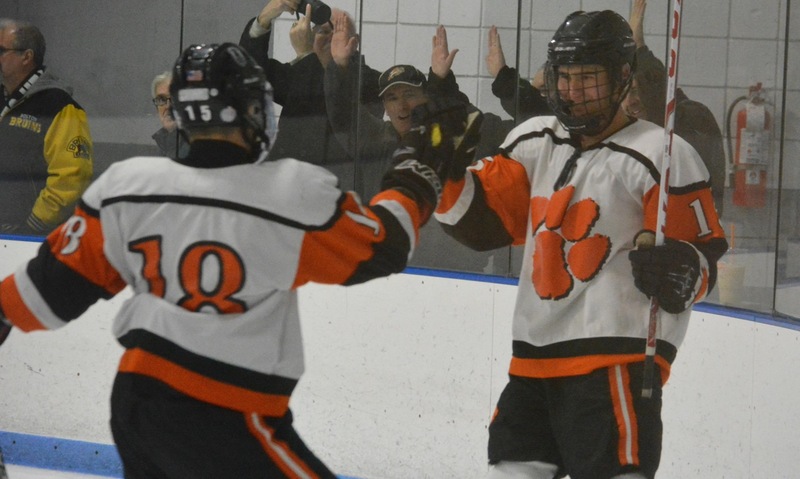 The senior defenseman, who is in his fifth season on the varsity roster, has been a three-time Hockomock all-star and was a backbone on the Tigers last winter as the team returned to the postseason after a long wait. The expectations will be even higher this season, as Taunton looks to build on that success and consolidate itself into a program that can reach the playoffs every season. While offense stole the headlines last winter, Terry was a mainstay on the Tigers top defensive pairing and gave Taunton a physical edge in its defensive zone. Terry had seven goals and nine assists for 16 points last year. After getting a taste of the tournament last season, the Tigers will be hungry to get back there and the ultra-experience Terry will be one of the players counted on to lead them during the league campaign. 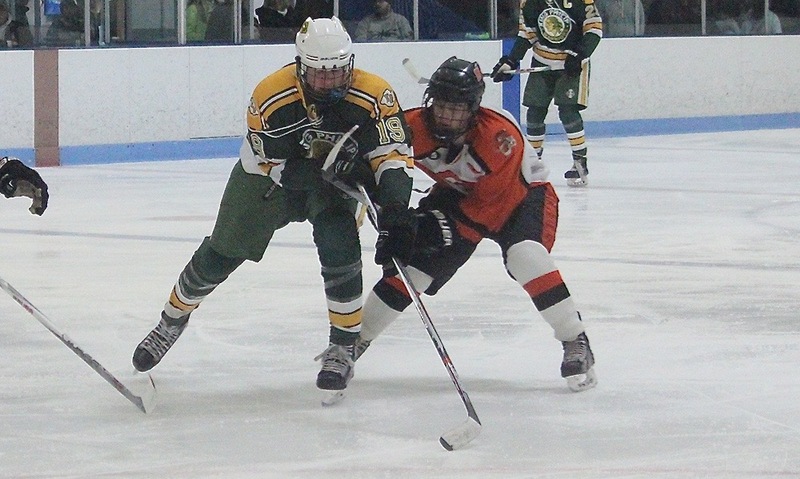 After spending last season in juniors, senior forward Joe Olsen is back with the Hornets for this winter and is ready to pick up where he left off after a strong sophomore season. 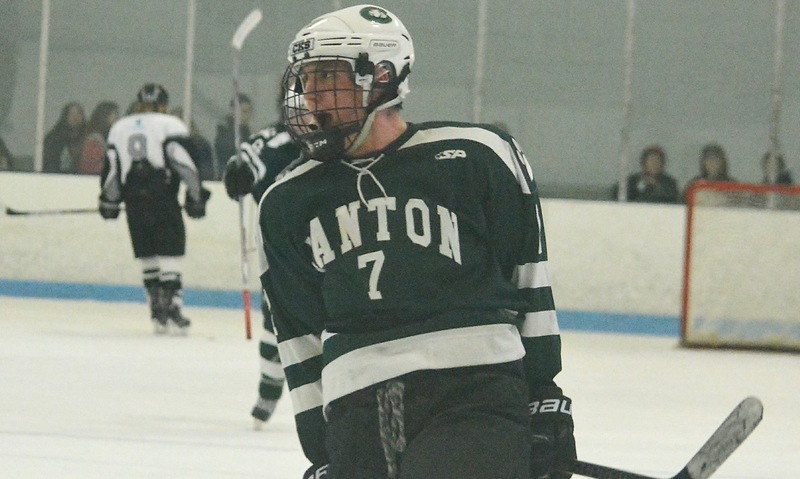 Olsen will be on the first line with classmates Matt Farragher and Chad Piotti and will be a pivotal returning player for first-year head coach Mike Balzerini, as Mansfield looks to find more scoring punch. Olsen is a strong skater with solid skills and he can be a critical piece for the Hornets, who are looking to get back in the Kelley-Rex title race after a difficult 2015-16 campaign. With the experience that he picked up during his time in juniors, Olsen should be able to mesh well on the top line and create opportunities for his teammates. There have been a lot of great goalies in the Hockomock League in recent years and North Attleboro’s Ryan Warren added his name to the list after a stellar freshman season. Now a sophomore, the reigning HockomockSports.com Underclassman of the Year is looking to build upon last year. He recorded 413 saves last season and had four shutouts. He also had a .918 save percentage and a 1.85 goals against average for the Rocketeers. North Attleboro returns a big group of experienced players this year, including a strong group of defensemen. Warren stands tall in net and moves side to side very well. He showed last year that he positions himself well and doesn’t allow too many second chances — and when he does, he does well to keep the puck away from dangerous areas. Warren could elevate to an elite level during this season. Below are the official Hockomock League Hockey All Stars, selected by the coaches in the league.